It was a pleasure having dinner with Will of A Suitable Wardrobe in San Francisco last week, if only for the wonderful food at Kokkari and Eleni, our lovely waitress. But perhaps most sartorially significant was that I picked up two metres of blue voile. The cloth is that offered by Will on his online store: a fine cotton voile woven in France on 18th-century looms. The description of it as extremely lightweight but not transparent is accurate, fortunately for me as I am more likely to wear it without a jacket than many bespoke customers, certainly including Will. It will be taken to Turnbull & Asser this week, where I have had all my shirts made for the past two years, and made up in a button-down, single-cuff bespoke shirt. I have never previously brought my own cloth to T&A, so this will be a new experience and one that could open up a new world of shirting possibilities. T&A charges £120 to make up the shirt, which is pretty good value considering a standard bespoke shirt from them costs £200 and Will’s cloth set me back $110, or around £70. It also allows me to expand beyond the range of cloths on offer at T&A, which is broad in some ways but limited in others. There is an impressive range of multicoloured stripes, many of them unique to T&A. But as 90% of my shirts are plain blue, I’m more interested in experimenting with cloths and weaves than I am with colours. Frankly, I find a strongly striped shirt limits too much what pattern and colour can be worn elsewhere. I’ll report back on the process and results. 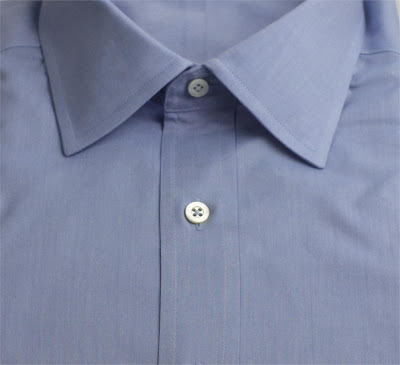 You can follow the discussion on Bespoke blue voile shirt by entering your email address in the box below. You will then receive an email every time a new comment is added. These will also contain a link to a page where you can stop the alerts, and remove all of your related data from the site.